On June 8, Mayor Jim Watson and Ottawa Senators player Chris Phillips hosted #Ottawa4FortMac, a western themed fundraiser in support of the Canadian Red Cross’s emergency appeal and the United Way’s relief efforts directed towards helping the residents of Fort McMurray rebuild their lives and their community. Dozens of local businesses joined them in their commitment to helping those who have been affected by the devastating Fort McMurray fires, by providing the necessities needed to bring the fundraiser to life, from event production and performing artists to pizza and beer. Together, Mayor Watson, Chris Phillips and the generous sponsors and donors raised $ 128 580.44. 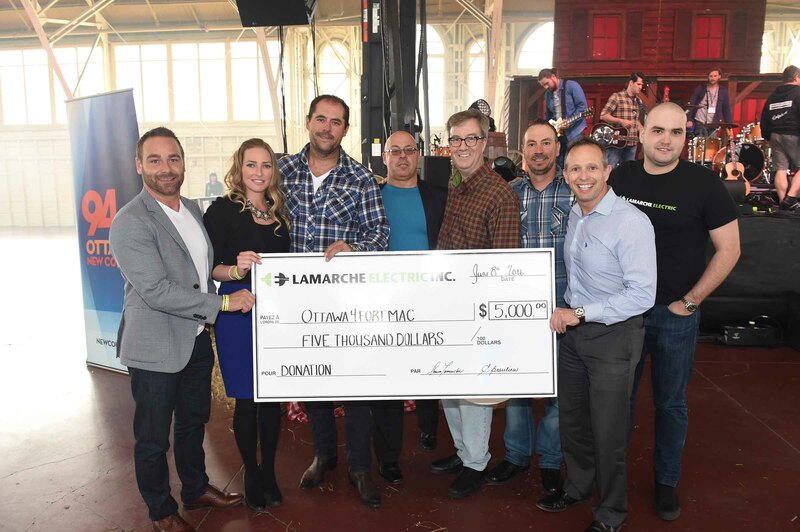 Hundreds of people gathered at the Aberdeen Pavilion at Lansdowne Park and enjoyed the performances of Kira Isabella, the River Town Saints, The Abrams, Jordan McIntosh and Meghan Patrick, courtesy of Ottawa’s New Country 94 and Bell Media. Operational logistics for the evening were generously donated by Brookstreet Hotel, Avant-Garde Designs, Event Design Group, Lamarche Electric, Securitas and Mediaplus Advertising. Food was provided by Delta Ottawa City Centre, Gabriel Pizza, Milano Pizzeria, Beneci Pizzeria, Crust & Crate Public House, Newport Restaurant, Bakery Baby, Lone Star Texas Grill, Papa Jacks and Sobey’s Barrhaven. Samplings of beer were provided by Beau’s All Natural Brewing Co., Beyond The Pale Brewing Company, Bicycle Craft Brewery, Big Rig Kitchen & Brewery, Broadhead Brewing Company, Cassel Brewery, Clocktower Brew Pub, Dominion City Brewing Co., Kichesippi Beer Company, Lowertown Brewery, Whiprsnapr Brewing Co. and Waller Street Brewery and kept cool with ice provided by Levy Restaurants. Mayor Watson and Chris Phillips would like to thank all the generous sponsors, donors, attendees, and supporters, and are proud of the compassion and leadership that Ottawa has expressed.